The iced coffee we started with was premixed with milk, but had a liquid sweetener on the side, allowing you to sweeten to taste, which was greatly appreciated since we find most places have sweetened their iced coffee more than we’d like. We started off with complimentary bread, which was crispy and accompanied by two dipping sauces that we couldn’t identify. The red one was sweet while the green one was mildly spicy. Regardless, we enjoyed the texture of the bread and the interplay between the two sauces. 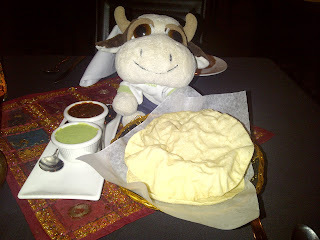 Their naan was also tasty being both slightly crispy and soft at the same time. The aloo gobi, a dish made of potatoes, cauliflower and Indian spices, felt light and was well seasoned. The remainder of the meal was neither impressively good nor bad, with the saffron rice being a bit on the dry side. 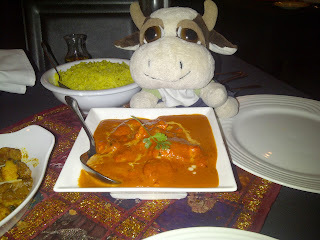 The butter chicken was creamy and spicy, but the tomatoes in the sauce were overpowering much of the seasoning within. The vegetable samosa was somewhat greasy and had a mild taste, although I knew there were spices in there they were so mild you could hardly taste them. 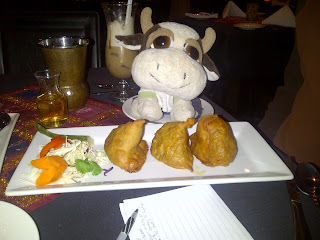 The paneer pakora, a type of fried cheese, was nice and soft inside, but suffered from the same seasoning problem as the samosa. To finish we ordered kulfi, a frozen dense ice cream like dessert, thinking it would be similar to the one that @michpetersjones makes, but found it to be cloyingly sweet and thick. The gulab jamun, a ball of milk solids, deep-fried and served in sweet syrup, had a doughy texture. It was unfortunately not smooth like those we’d experienced at other Indian restaurants previously. Overall we were left feeling somewhat unimpressed with their dinner menu, and wishing that we could find a place that served Indian food that would wow us that was located downtown. I've never had the dinner spread at Haweli but the lunch buffet is pretty ok. Give Khazana on 107 Street a try. They're right in the downtown area and their food is consistently good. We have indeed been to Khazana. That review will be coming soon, keep an eye out for it. PS. How did you do that "You might also like" links at the bottom? Really cool.